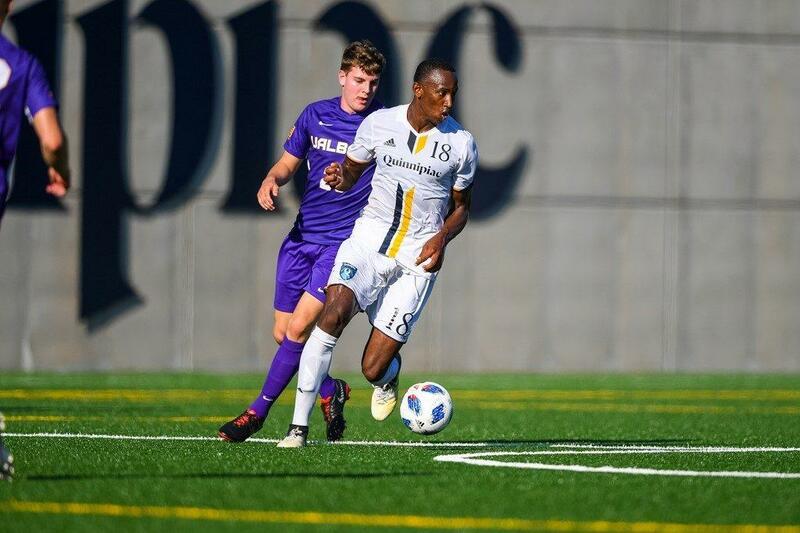 Two goals from Matthew Taylor lifted the Quinnipiac men’s soccer team (2-4-1, 0-0 MAAC) to a solid 2-1 victory over in-state rivals Central Connecticut State (0-6-0, 0-0 NEC) Friday afternoon. Taylor, the senior from Dublin, Ireland, scored his first goal of the season 13 minutes in to give the Bobcats their first lead of the match when his deflected shot looped over the outstretched glove of Blue Devils goalkeeper Carson D’Ambrosio. After stifling Central Connecticut’s attack for most of the first half, the Blue Devils were able to break through late in the half to even the score at one. Bobcat keeper Jared Mazzola made a save on the initial shot from Noah Silverman, but Louis Beddouri was there to tap in the rebound for the Blue Devils. Quinnipiac looked like a different team in the second half, as they put loads of pressure on Central Connecticut’s defense but were unable to find the back of the net early in the half. That sustained pressure paid off however, as Matthew Taylor rifled a volley past D’Ambrosio off a deflected Quinnipiac corner to give the Bobcats a 2-1 lead. Central Connecticut did not go down without a fight, as senior Danny LoBello had a prime opportunity off a corner for the Blue Devils but headed it just inches over the crossbar, to the relief of many in the stands cheering for the Bobcats. Things got a little heated following Taylor’s second goal, as each team received a yellow card for dangerous fouls in the final ten minutes. Oriac Vila, who scored the game-winning goal for the Bobcats in the last game against Albany, was handed a yellow with about two minutes to go, and committed another dangerous foul seconds later that teetered on card-worthy. Vila fortunately escaped a second yellow and the Bobcats were able to finish the match with a full eleven. Despite two straight victories to close out non-conference play, coach Da Costa knows there is room for improvement from his side. The Bobcats kick off MAAC conference play next Wednesday when they travel to Canisius. Central Connecticut State will look for their first victory of the season on the road against Hartford Tuesday.